From the back deck of David and Terri Clayton’s Colorado timber home, visitors enjoy far-ranging views across the East River valley and the jagged stone spires of the Elk Mountain range. Such scenery was a key reason for selecting this spot. “When the property became available, we thought it was the perfect lot, because it has a view that will never be obstructed,” recalls Terri. The Claytons’ home sits on the northeastern limit of Mount Crested Butte, a tiny, mountain town surrounded by Gunnison National Forest. To the rear of their one-acre property, protected woodlands and brush-covered mountain prairies stretch on for mile after mile. “We told the architect that we wanted to see that view from every living space within the house,” David says. Also on the Claytons’ wish list was a main-level master suite for single-floor living, a bathroom off every bedroom, an open floor plan and an exterior design that reflects the region’s history. The exterior of the home borrows heavily from the architectural details of area mines. 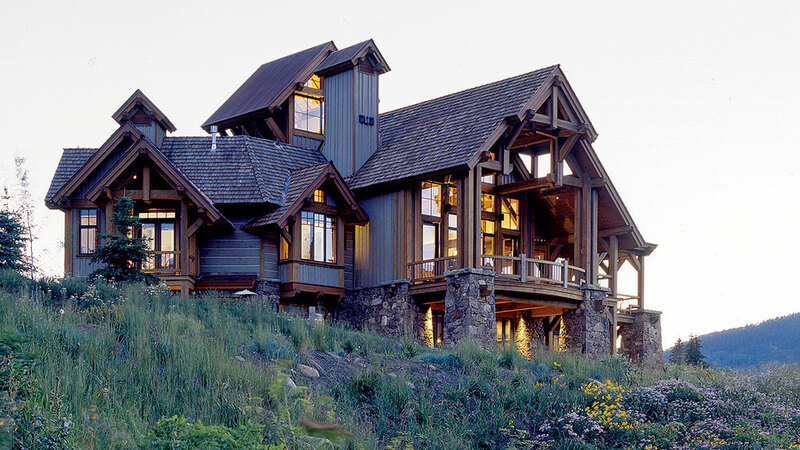 The 5,000-square-foot timber-frame home, completed in 2006, is laid out as a cluster of interconnected buildings, built around an open courtyard at the front of the house. A 35-foot, clerestory tower at the front of the house mimics a mine shaft and is surrounded by three outbuildings, with the whole of the design accentuated by individual roof lines and matching cupolas. “The parts of the house that stick out at different angles represent the buildings you might have around a mine — the offices, the bunk house and things like that,” explains David. The garage, mudroom and rear wall of the master suite form the sides of the courtyard and face upslope, blocking views of the road, another lot and the ski lift that sits 75 yards from their home. At the back of the house, however, a panoramic expanse of windows fills the rear walls of the great room and dining room. “One thing we hear over and over again when people come to the house is that it is a very comfortable house and that it just flows very well from room to room,” David says. Architect Gary Hartman of Sunlit Architecture worked with the couple to finalize the details. His favorite aspect: the home’s impressive beam work. The timbers are reclaimed Douglas fir, salvaged from an early 20th-century train trellis that once spanned a portion of the Great Salt Lake. All of the trusses are derivatives of the hammerbeam truss, with each set altered slightly for a unique appearance. In the great room, for example, a horizontal crossbeam ties one truss to the other, lending more weight and presence to the structure. “We think of timber work in a three-dimensional nature, and by tying the trusses together in a three-dimensional way, we bring the volume of the space down,” explains the architect. This truss work then continues through the rear wall and extends out over nearly 600 square feet of decking, wrapping from the rear to the side of the house. The extended roof plane, which covers the entire deck, provides shelter to the space below, where a wood fire ring lends warmth on even the harshest winter day, making the Claytons’ deck an ideal spot from which to marvel at the view year-round. Terri Clayton’s favorite room in the house, the kitchen, is a “cook’s kitchen,” she says. 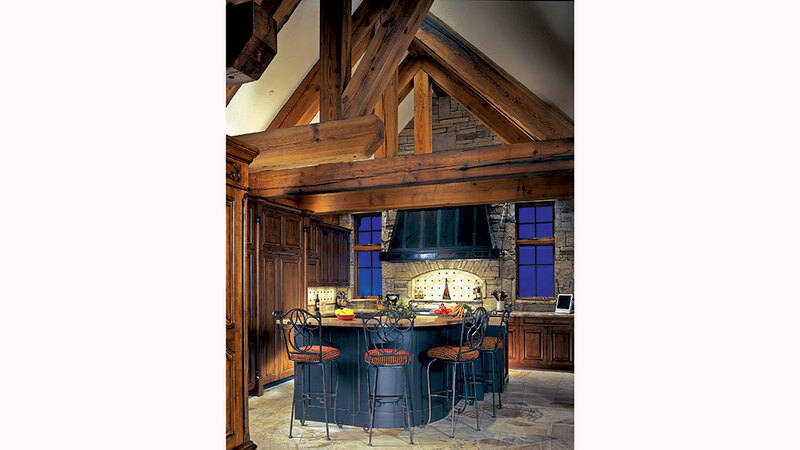 It’s comfortable to work in, yet inviting for guests who congregate around the impressive 12-by-6-foot oak-topped island. The trusses in the great room were built using reclaimed Douglas fir from an old train trellis. Natural aging provides all the color in the timbers, which were waxed to help preserve their appearance. 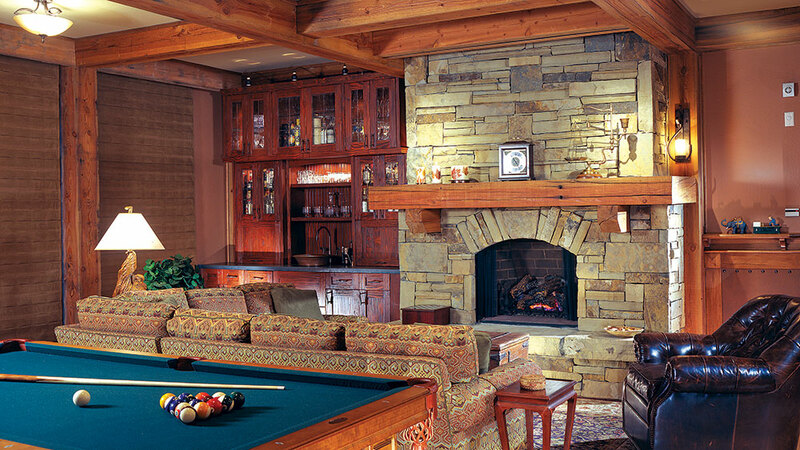 The lower-level family room is one of David Clayton’s favorites. Four of the home’s five bedrooms extend off the family room. Glass doors open onto a patio, and best of all, says David, a 100-inch TV screen drops down from a false beam in front of the fireplace — perfect for watching a ballgame. beam truss. David helped redesign the trusses to eliminate the iron collar ties originally planned. 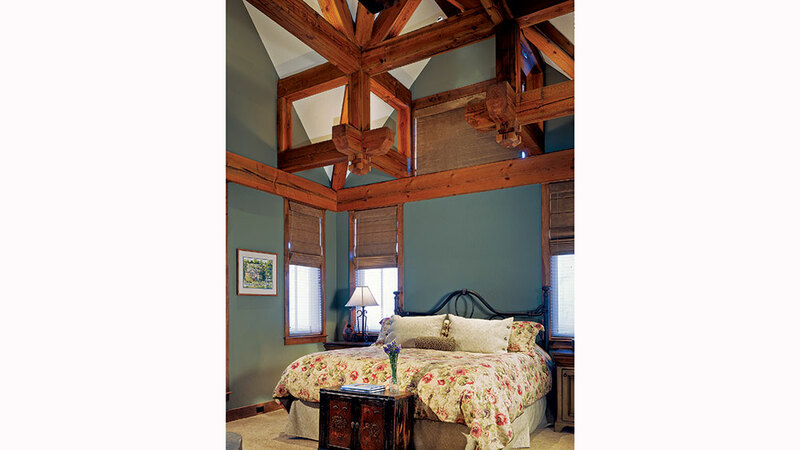 Also omitted was the anticipated cedar ceiling in favor of a white ceiling to emphasize the timbers. Terri is a fan of the master bathroom. The bath was built nearly two-thirds the size of the master bedroom. 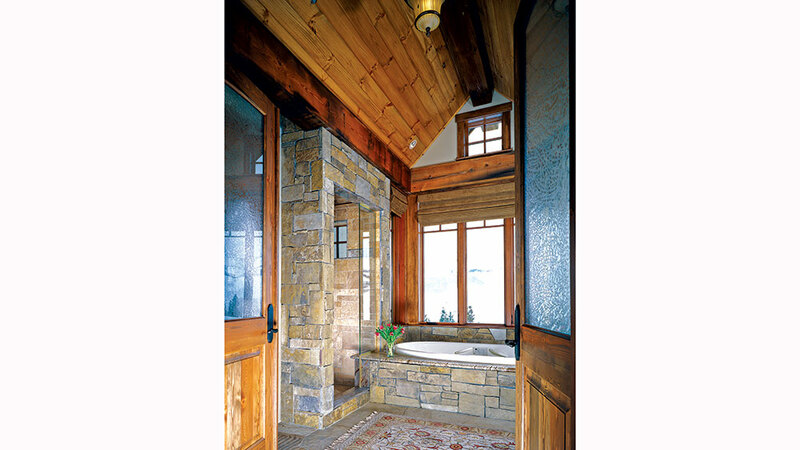 The stone-encased Jacuzzi bath overlooks the home’s stunning view and provides the owners with a feeling of privacy that only seclusion can provide.